Once in awhile, I scour Craigslist for freelance jobs. And once in awhile, an actual, honest-to-true job will reply back. 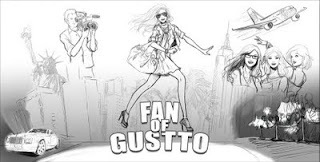 Gustto, the designer handbag company, contacted me for one such project. The concept was to create a banner that would be based off of a 1960s movie poster with elements mashed-up together in a sort of collage. Here's one of 6 pencil drafts I went through, one colored rendition, and then the final. I believe I went through about 12 different versions with this. Phew! This was in a style very far from my own, since fashion illustration usually calls for long legs and sketchy watercolors. It was a pretty big change!! looks like you pulled it off herbst. Congrats on the awesome job!!!! The final turned out great. I really like the lighting effects.